It’s supposed to cover civil partnerships too (might buy them a nice stay in a B&B), but Sunder thinks it will be hard for Cameron to find himself any beneficiaries there. Pensioners are likely to get a third of it – A very welcome boost on pensioner poverty, but would another Â£150 on winter fuel not be better targeting – or is divorce and anti-social behaviour amongst pensioners one of the main indicators of the Tories’ Borked Britain? And then there’s the amount. Not enough to be a bribe, or to genuinely be of help to families – something that few people will get, and those that do get won’t notice.Â Shudder the thought it might be calculated to be the cheapest way possible to avoid the embarassment withdrawing the silly policy. As is stands it seems to fall squarely into the category of ‘pin money for wives who know their place”. 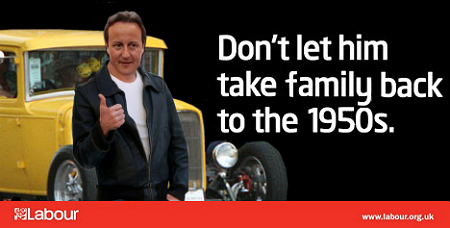 Sod Gene Hunt, it seems like Cameron’s taking us back to the 50’s.